One of three Nativity scenes designed in the 1920s by Bryn Athyn artist Winfred S. Hyatt (1891-1959). The scenes were commissioned by Raymond and Mildred Pitcairn for use in their home at Cairnwood, where they were considered to be the most important element in the elaborate Christmas decorations in the parlor hall. When the Pitcairn family moved to Glencairn in 1939 the three-part Nativity scene moved with them. Collection of Glencairn Museum. Photo courtesy of the Glencairn Museum Archives. Glencairn Museum is located in the former home of Raymond and Mildred Pitcairn in Bryn Athyn, Pennsylvania. The New Church (Swedenborgian) congregation in Bryn Athyn has a longstanding tradition of Nativities, several examples of which are in the Museum’s collection. 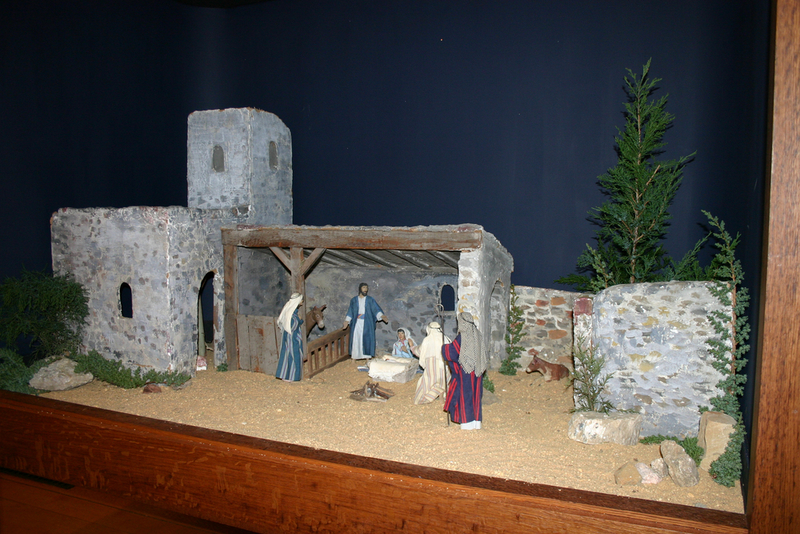 One is a three-part Nativity made for the Raymond Pitcairn family by Winfred S. Hyatt, a New Church artist (see photo, below); another is a handmade and painted chalkware set made by Theta Alpha International, a New Church women’s organization. The origins of the New Church lie in eighteenth-century Sweden with a scientist, philosopher, and theologian named Emanuel Swedenborg (1688-1772). At the age of 55 Swedenborg, the son of a Lutheran bishop, shifted his focus away from science and philosophy and spent the rest of his life writing twenty-five volumes of systematic theology. Swedenborg himself never attempted to found a religious organization, but New Church groups based on his writings began to appear shortly after his death. Bryn Athyn was founded as a religious community in the late nineteenth century by members of the New Church in Philadelphia, who moved their school and congregation north of the city to the countryside along the Pennypack Creek. The tradition of making Nativities began when the congregation was in Philadelphia under the leadership of Bishop William Henry Benade. Before joining the New Church Benade had spent his early career in the Moravian Church, as a minister and professor at the Moravian College and Theological Seminary in Bethlehem, Pennsylvania. In Bethlehem Benade would have been well aware of the Moravian custom of “putz” building. The term putz comes from a German word meaning “to decorate,” and is used to describe a traditional Moravian landscaped Nativity scene (see photo, below). In 1888 Benade replaced the traditional Christmas tree in the Philadelphia New Church building with an elaborate landscaped Nativity scene, which the congregation called a “representation.” A strong tradition of church and family Nativities continues to this day in New Church congregations around the world. This Moravian “putz” was owned by the Morris family of Bethlehem, Pennsylvania. It was set up in their home each Christmas season for over 150 years. The term putz comes from a German word meaning “to decorate,” and refers to a traditional Moravian landscaped Nativity scene. The Moravians first traveled to America as missionaries in the 18th century. They came to Nazareth, Pennsylvania, in 1740, and founded their first settlement in nearby Bethlehem in 1741. This photo dates to the 1940s; the Morris family putz is now in the collection of the Moravian Historical Society, Nazareth, PA. Photo courtesy of the Moravian Historical Society. Raymond Pitcairn (1885-1966) spent his childhood in Bishop Benade’s Philadelphia New Church congregation, where he would have been familiar with the church’s landscaped Nativity scene. At the age of ten he moved to Cairnwood, his family’s newly-constructed Beaux-Arts mansion in Bryn Athyn. 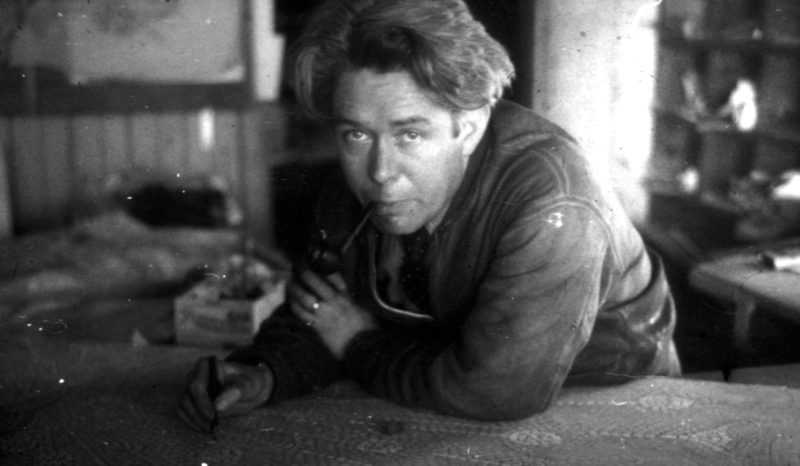 As an adult Pitcairn went on to supervise the construction of Bryn Athyn Cathedral, and later Glencairn, a home for his family and art collections. Pitcairn was still living at Cairnwood with his wife and children in the 1920s when he commissioned Winfred Sumner Hyatt (1891-1959) to design and build the family’s three-part Nativity scene. (Hyatt was the principal stained glass artist and designer for Bryn Athyn Cathedral and later Glencairn.) 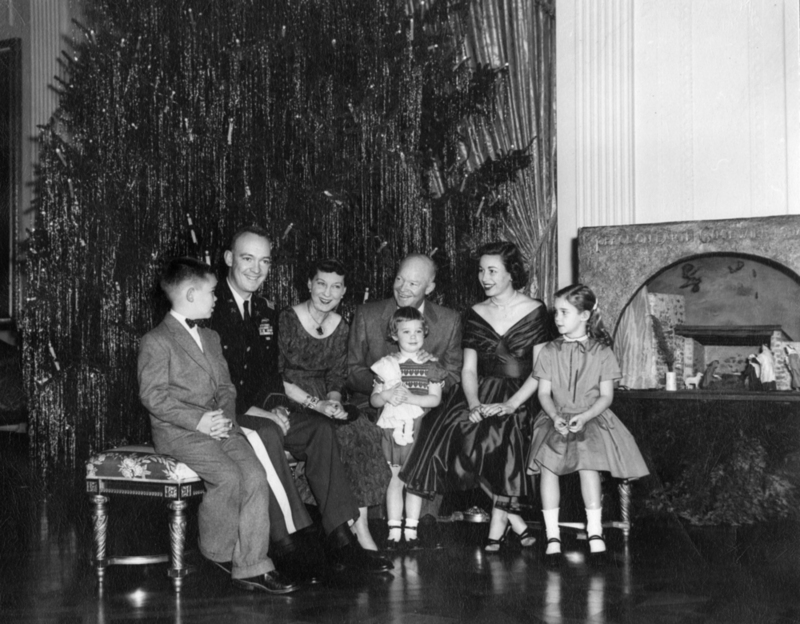 In addition to the Nativity scenes made for the Raymond Pitcairn family during the 1920s, Hyatt went on to make similar scenes for Bryn Athyn Cathedral, the Harold Pitcairn family (Raymond’s brother), and the Eisenhower White House (see photo, below). The East Room of the White House at Christmas time. In 1954 Raymond and Mildred Pitcairn commissioned Winfred S. Hyatt to make a Nativity scene for President and Mrs. Eisenhower. The scene was displayed in the East Room of the White House that same year. Two more scenes were added in 1957, when all three were displayed together next to the Christmas tree. Photo courtesy of the National Park Service (Abbie Rowe). Winfred Hyatt was born in Toronto, Canada, to a New Church minister and his wife. In 1908 he came to Bryn Athyn to enter the Academy of the New Church Boys School. He later attended the Pennsylvania Academy of the Fine Arts, winning two Cresson traveling scholarships during his time as a student. A letter written by Raymond Pitcairn to Hyatt (January 15, 1924) during the beginning of his work on the family’s Nativity scenes indicates his desire that historical accuracy be taken into account as well as artistic composition. Pitcairn was involved in the process, writing to Hyatt that “I should like to go carefully over the arrangement.” Hyatt modeled all the figures, which were then cast in plaster, painted, and clothed. The story of the Nativity is depicted from left to right: the first scene is the Annunciation to the Shepherds; the second portrays the Nativity; and the third shows the wise men gazing at the Star of Bethlehem. Bryn Athyn artist Winfred S. Hyatt, principal stained glass artist and designer for Bryn Athyn Cathedral and later Glencairn, made three Nativity scenes for the Raymond Pitcairn family during the 1920s. Hyatt also made Nativity scenes for Bryn Athyn Cathedral, the Harold Pitcairn family (Raymond’s brother), and the Eisenhower White House. Photo courtesy of the Glencairn Museum Archives. Mildred Pitcairn at Glencairn with her grandchildren in 1967, in front of a Nativity scene made for the Pitcairn family in the 1920s by Winfred S. Hyatt. Photo courtesy of the Glencairn Museum Archives. Bryn Athyn Cathedral has three Nativity scenes made by Hyatt, very similar in appearance to the ones he made for the Pitcairn family (see photo, below). It is not known exactly when Hyatt produced these scenes, but an entry in the church’s journal New Church Life most likely refers to them: “After the service [Christmas Eve, 1929] the whole congregation filed out to the Choir Hall, where were three beautiful representations, modeled by Mr. Winfred Hyatt, and showing in the central scene the stable at the inn with the Holy Family and those who came to see and worship the Child, while on the one side was shown the angel giving his message to the shepherds, and on the other the wise men following the star through the desert” (New Church Life 1930, 189). Bryn Athyn Cathedral’s Nativity is still displayed each year at Christmas time in the choir hall, and a new wooden display case has recently been crafted to contain the scenes. The Hyatt Nativity that once belonged to the Harold Pitcairn family was given to the Glenview New Church in Illinois in the 1970s, and remains part of their annual Christmas decorations. Bryn Athyn Cathedral has three Nativity scenes made by Winfred S. Hyatt, very similar in appearance to the ones he made for the Pitcairn family. It is not known exactly when the scenes were made, but they were in use by 1929. After the Christmas Eve service in 1929, “the whole congregation filed out to the Choir Hall, where were three beautiful representations, modeled by Mr. Winfred Hyatt...” (New Church Life 1930, 189). Bryn Athyn Cathedral’s Nativity is still displayed each year at Christmas time in the choir hall. Photo courtesy of Bryn Athyn Cathedral. 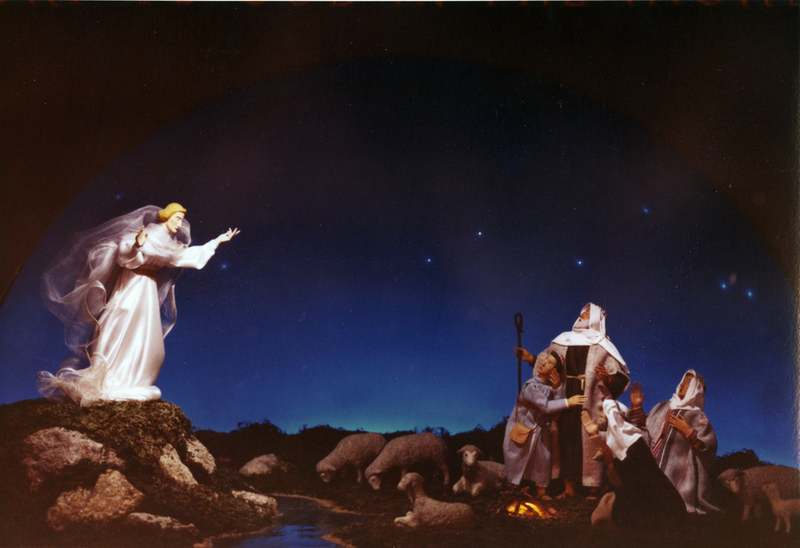 In 1954 Raymond Pitcairn commissioned Winfred S. Hyatt to make a single scene of the birth of Christ for President and Mrs. Eisenhower. Hyatt and several craftsmen from Pitcairn’s Bryn Athyn Studios produced the cabinetwork and landscaping, while Hanna Binder, an artist from Bucks County, Pennsylvania, carved the human figures from wood. The scene was displayed in the East Room of the White House that same year. Two more scenes were added in 1957 (see photo of the Annunciation to the Shepherds, below), when all three were displayed together in the East Room next to the Christmas tree. The Pitcairns were active supporters of Eisenhower’s presidency. They had been part of a Bryn Athyn “Eisenhower for President” petition drive in 1951, and the Eisenhowers visited Glencairn in 1961 to thank the borough for its support. The Eisenhower Nativity scenes are currently in storage at Gettysburg, Pennsylvania, where they are the property of the Eisenhower National Historic Site. The Annunciation to the Shepherds. In the 1950s Raymond and Mildred Pitcairn commissioned Hanna Binder, an artist from Bucks County, Pennsylvania, to carve the human figures for a three-part Nativity scene for the Eisenhower White House. Winfred S. Hyatt and several craftsmen from Pitcairn’s Bryn Athyn Studios produced the cabinetwork and landscaping. Photo courtesy of the Glencairn Museum Archives. Theta Alpha International, a New Church women’s organization headquartered in Bryn Athyn, began making Nativity sets in 1941 and continued the tradition for more than half a century, until the early 1990s. The Nativities were sent free of charge to New Church families who did not live near a congregation. This was part of a larger initiative by Theta Alpha to send religious materials throughout the year to children who could not attend New Church schools. The women of Theta Alpha were inspired in their production of Nativity sets by Emanuel Swedenborg’s concept that children are especially receptive to visual images, and can be introduced into deeper theological concepts by means of them. A large number of these sets have survived and they retain a cherished place in the Christmas decorations of many New Church families (see photo, below). Theta Alpha, an organization for New Church women, began making chalkware Nativities in 1951, and continued the tradition until the early 1990s. The sets were initially made by teams of women working in the basement of Bryn Athyn Cathedral, and sent to families around the world who did not live near a New Church congregation. Collection of Glencairn Museum, gift of Theta Alpha International. The figures made during the 1940s were constructed from wire and crepe paper. They were assembled by Theta Alpha members living in several different locations in the United States, and were sent to New Church families around the world. Theta Alpha’s chalkware Nativity sets were first made in 1951, and included Mary, Joseph, the baby Jesus, one sheep, a manger, and a stable. They were initially made by teams of women working in the basement of Bryn Athyn Cathedral. Gypsum plaster (plaster of Paris) was poured into latex molds and allowed to dry (see photo, below). Then, after the figures had been extracted from the molds, they were carefully painted by hand. Suitable commercial figures were chosen to be used in the production of the molds, although records indicate that a few of the figures were made from original designs (e.g. one of the shepherds and the baby Jesus). Theta Alpha groups in Glenview, Illinois, Pittsburgh, Pennsylvania, and Bryn Athyn, Pennsylvania, worked together to create the chalkware figures that made up the complete Nativity scene. In the year 1952 alone, 255 sets were sent out to New Church families around the world. According to Carita de Charms, chairman of the Creche Figure Project, “Not to my knowledge have we ever had such cooperation, such faithful working together of so many women to accomplish an end” (Carita de Charms, “Report of the Creche Figure Project,” Theta Alpha Journal 1952, 16). Collection of Glencairn Museum, gift of Theta Alpha International. 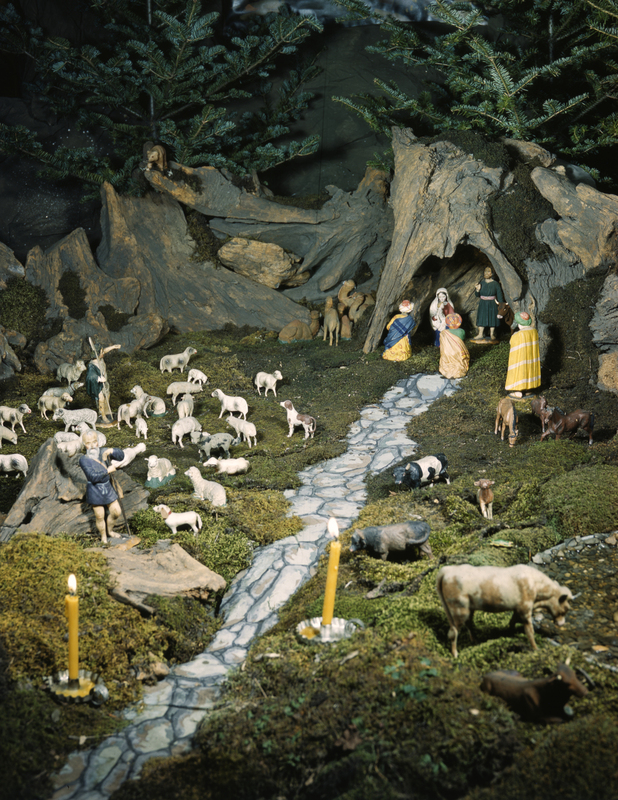 In 1952 four shepherds and seven sheep were added to the scene, followed by three wise men and three camels in 1953. In time a system was worked out between Theta Alpha groups in Glenview, Illinois, Pittsburgh, Pennsylvania, and Bryn Athyn, with each group providing one of the three sets that made up the complete Nativity scene. In the year 1952 alone, 255 sets were sent out to families in Africa, Canada, Denmark, England, Holland, Mexico, New Zealand, Norway, Palestine, Sweden, and to many locations within the United States. Eventually molds and instructions were sent to Australia, England, and Canada, so that church members in these countries could make their own Nativities.